Today I bring you another watercolor painting.... I've been painting A LOT lately :) Yeah! 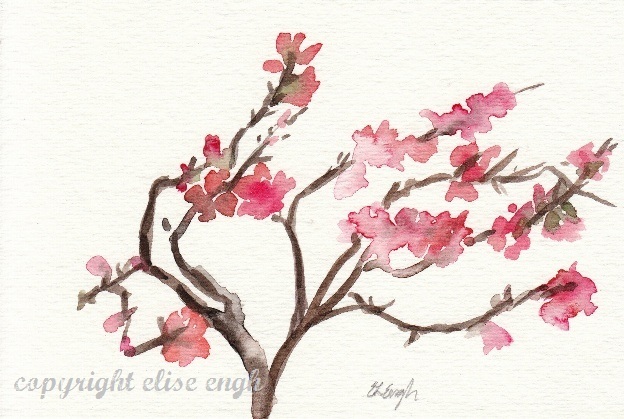 This one really makes me happy and since it's tiny (4 x 6 inches), it didn't take very long at all to paint. Don't you think it looks nice framed? I don't know if I'll be able to let this one go to sell in my etsy shop... I may have to keep it for myself! I LOVE LOVE LOVE this! Japan is the first thing that came to mind when I saw the first image. I love that your painting gives me the same feeling that I experienced from the surrounding beauty when I lived in Japan. That's beautiful Elise! Lovely painting - I'd be keeping that one for sure!! Beautiful! You have true talent! Beautiful! Would love to see it on a piece of fabric, for a dress, or all sorts of things. But it looks lovely framed, too.